You have achieved free shipping! What would happen if you let a Flatnose Shad mate with a Dragon Tail? Well, here she is - let us introduce the new Flatnose Dragon. This product will #cashback 2.5 fishcoins when recycled! This purchase will pay 278 fishcoins now! When we filmed Fly vs Jerk 8 back in 2016, Niklaus Bauer was using a completely new kind of tail on his flies called "Dragon Tails". The movement of the tails were mind-blowing and they instantly proven themselves really effective. We were amazed about these tails and instantly got the idea that this kind of tail has to work excellent on a softbait as well. So, we spoke with the man behind the Dragon Tail, Paolo Pacchiarini from Italy, and got his approval to use his awesome design. And here she finally is - the Flatnose Dragon. 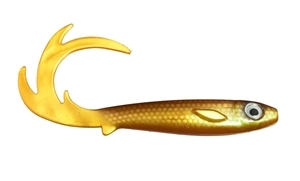 Rig it on a Shallow Screw or Flexhead Pike together with a Shallow Stinger Small. Rigged on a Flexhead Pike or regular jig head, some of the wiggling action of the body disappears but it still works wonders and catches loads of fish. Just imagine what this tail does on the drop if you give it a pause in the water… Make sure to be ready to set the hooks! For maximum body movement, you can try to have the hooks free hanging instead of attached in the rubber. It's also important to get the shallow screw as centered as possible, or slightly offset closer to the belly of the lure. Every change in rigging can change the action and we recommend you to experiment until you find your favorite. Our favorite is to have it shallow rigged and adjust the fishing depth with Fastach sinkers in various weights. 50 grams, 27 cm with tail stretched out. Perfect for Gator Gum 17 cm and other lures in that size. Ready-to-use stinger for your rubber bait. Flatnose Shad - Clear Blue Lemonade - "Mille's 10+"
Ready-to-use stinger for your smaller rubber baits. A badass pike swimbait designed by Ola Lures - high-end pike candy! This bait is a result of a lot of mind work and knowledge. Weight with fastach - it has never been more easy! The Pig Shad from Strike Pro - a first class pike snack! The Pig Shad Jr from Strike Pro - a first class pike snack! Razor sharp jig head, perfect to use for perch or bass fishing. Weighted jig head with attachment screw. Stinger spikes from BFT for creating your own stingers. Magic Minnow Fly - "The Perch Pro Fly"
This material have perfect long fibers that works to build heads on your flies. New lure that will make you outstanding when the fish are lurking in the grass. Snaps that makes it easy to switch between different Wiggle Tails.